Owner Pat Keown has been part of the family wine business for 25 years and he has made the Hungry Monk a serious destination for aficionados and new converts alike. His wine list is a connoisseur's selection running to more than 600 bins, with just about every oenophilic country and region represented, lots of half bottles, plus organic names and a tantalising choice of dessert tipples. On the food front, the kitchen makes admirable use of seasonal produce for a comforting menu that highlights local game and Castletownbere seafood. Dishes tend to depend on the catch or the shoot, but everything is treated with due respect. Other options might include lamb's kidneys in Madeira sauce with truffle mash, roast fillet of pork with Savoy cabbage, black pudding boudin, apple and cider puree, or breast of Cootehill Farm chicken stuffed with baby spinach. The wine bar below stairs is open from 5.00pm seven days a week: expect casual, bistro-style food and a trimmed-down selection from the full wine list. Served with garlic and smoked paprika aioli, aged parmesan shavings. Served with chive crème fraiche. Served with a fig and ruby port relish and crispy white bread. Diced and pan fried with shallots in a creamy wholegrain mustard and Cognac cream sauce. Served with wild rocket in a lavender honey and Dijon mustard vinaigrette. Served with a Conference pear and star anise compote. Succulent Irish chicken breast served in a mildly spiced peanut sauce with soy noodles. Served with aged parmesan shavings and a drizzle of pesto oil. Undyed smoked haddock in a white wine cream topped with gruyere cheese in a puff pastry case. Fresh prawns coated in golden breadcrumbs and served with a ramekin of homemade tartar sauce. Served with crunchy celery sticks and a Cashel Blue cheese dip. Served with a citrus oil dressing and homemade brown bread. a toasted brioche bun with home- cut chips. with aged parmesan shavings, pesto oil. Served with basmati rice, mango chutney and a poppadom. 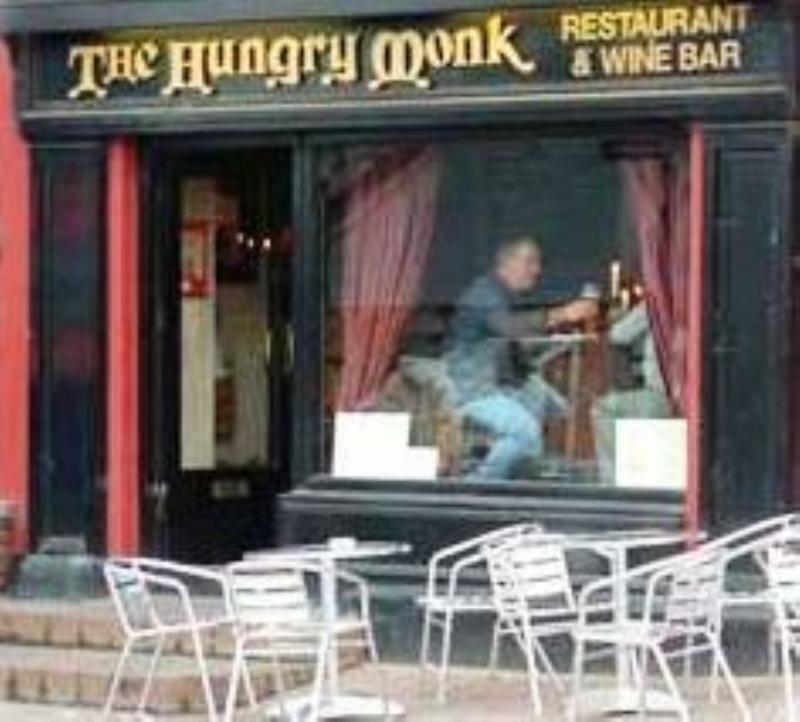 The Hungry Monk "Pie of the Day"
Check out our blackboard to see today's pie. jacket chips and mushy peas. Iberico chorizo sausage, patatas bravas with green beans and a rich tomato ragu. Served with apple and vanilla puree, bacon champ and a rich pork jus. Pasta dish served in a fiery tomato and mascarpone sauce with grated parmesan cheese and garlic bread. Served with sautéed onions, hand-cut maris piper chips and creamy black peppercorn sauce. Fresh Dublin Bay Prawns, coated in breadcrumbs and served with tartar sauce and hand-cut chips.